Hiking is a wonderful activity and a great way to enjoy the beautiful outdoors. 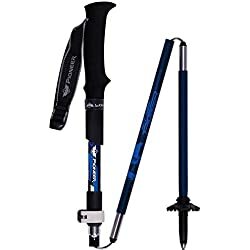 One thing many hikers will tell you is that it is important to have all the correct accessories for hiking and this includes a good pair, if not the very best hiking poles. Although they may look like a simple piece of equipment there is quite a few things to consider before buying a pair of trekking poles. In this guide we will be explaining all you need to know before buying and what it is you should be looking out for when deciding which ones are best suited to you and your needs. In our review section we will be bringing you the top choices and explaining what it is that makes them among the best models available. The first thing to consider before buying is what materials you want your hiking poles to be made from. Generally speaking there are two choices and these are carbon fibre and aluminium. 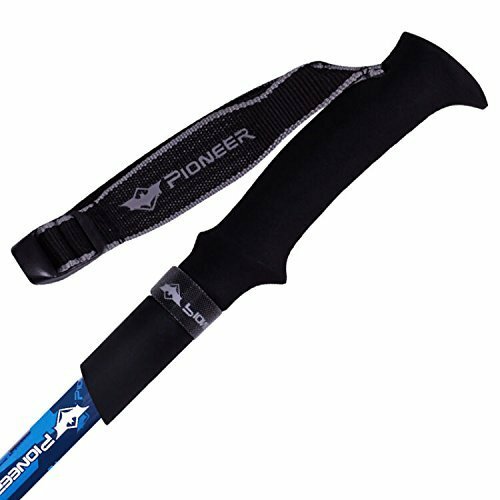 Carbon fibre hiking poles are the lighter of the two and they tend to be the most popular. With that been said, they can be prone to breaking as they are not as durable as aluminium hiking poles. If you do your research you will find both negative and positive customer reviews on both types of material. Adjustability is a key feature of trekking poles and although not all of them are adjustable, I would recommend buying adjustable every time. Been able to adjust the length of trekking poles is very important for when hiking uphill and downhill. When going uphill been able to shorten the length is an important safety feature as is been able to increase the length for when journeying downhill. 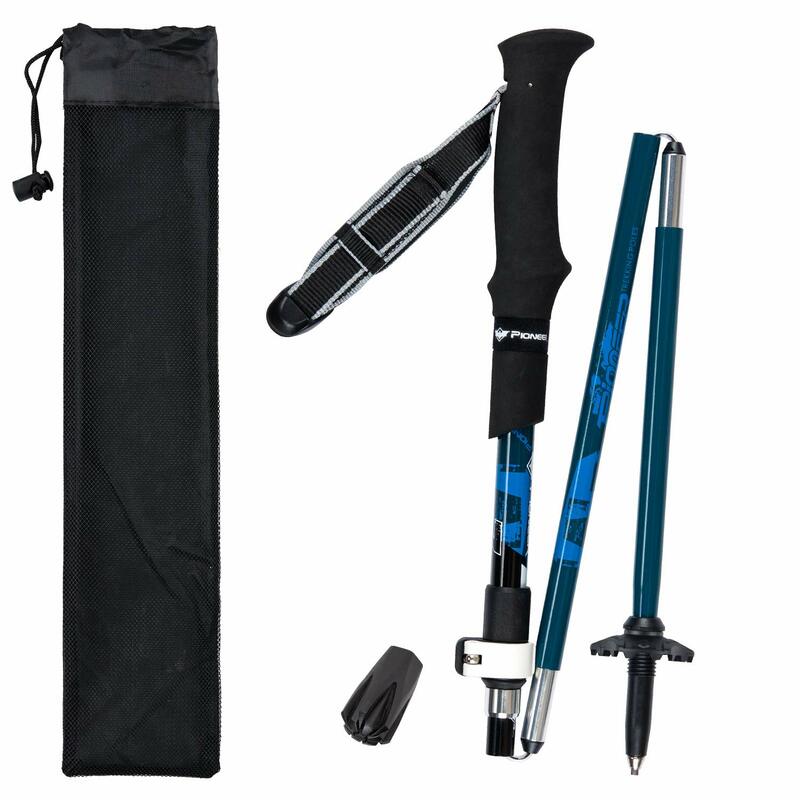 Foldable hiking poles are great for easy transportation and their space-saving design means they can easily fit inside a hiking backpack when not been used. On the other end of the spectrum they are more expensive and not as strong as a traditional 1-piece hiking pole. The decision of whether or not to choose a pair of folding hiking poles is a matter of personal preference and weighing up the pros and cons for each individual person. 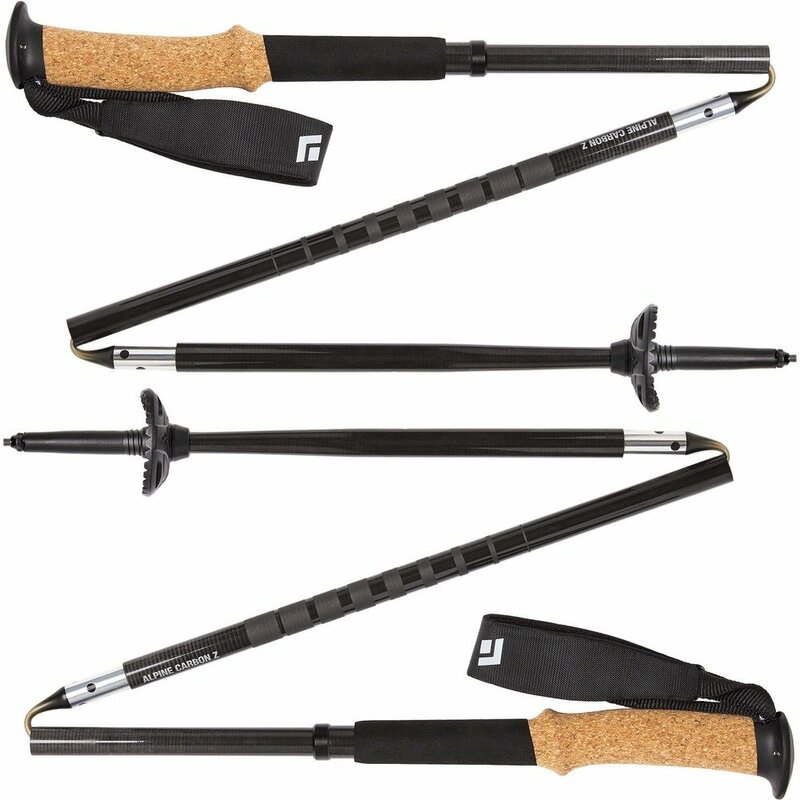 Some walking poles come with a built-in anti-shock system. This is especially beneficial for reducing pressure on the back, hips, knees and ankles. If you are suffering from an injury or a medical condition I would recommend buying hiking poles with this feature. In addition it is also possible to buy walking poles that allow you to turn this feature on and off when needed. The grips of your hiking poles are another important safety feature. During a long trek on a hot day you will begin to get sweaty hands, this is where the material that the grips are made from comes in to play. Most trekking poles have either rubber or cork grips. Although rubber grips are deemed more comfortable they lack the grip of cork, especially when your hands are sweaty. As we all know it only takes one fall on some harsh terrain and your hiking days could be over for some time. Personally I would recommend going with cork hand grips as they are the safer option. On the downside they aren’t as durable as rubber grips. If you are among those that think hiking poles are only for the elderly then you are surely mistaken. Hiking poles have a good number of advantages to walkers and hikers of all ages. Below you can find a list of what we think are the best reasons for investing in a pair of good quality trekking poles. As you can see there are a good number of reasons to invest in hiking poles. Essentially speaking they are a must have piece of safety equipment that will help to ensure your hikes are as safe as possible. Now that you are prepared with all the knowledge for choosing the correct hiking poles for your needs its time to take a look at the best models in Australia. 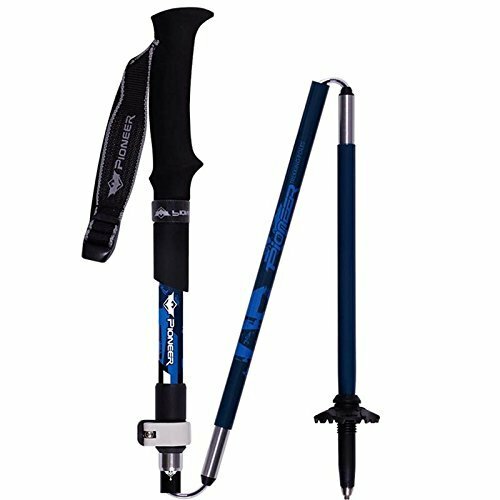 Offering excellent value for money the Black Diamond Trail Ergonomic cork hiking poles are a high-quality affordable option. Featuring a 3-piece adjustable shaft and made from durable aluminium they are designed to stand up to the test of time. 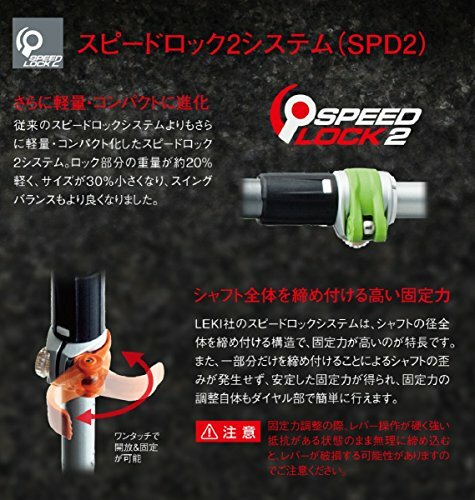 Another positive feature is the flicklock system which is considered the safest locking mechanism for hiking poles. Like all the best models they come with a 15-degree angled handles for comfort. In addition the cork handles are great for providing good grip. Adjustable from 74 cm to 140 cm and weighing only 255g they are very practical and offer adequate comfort and durability. Leki are another well recognised hiking brand and they have a solid reputation for top quality products. 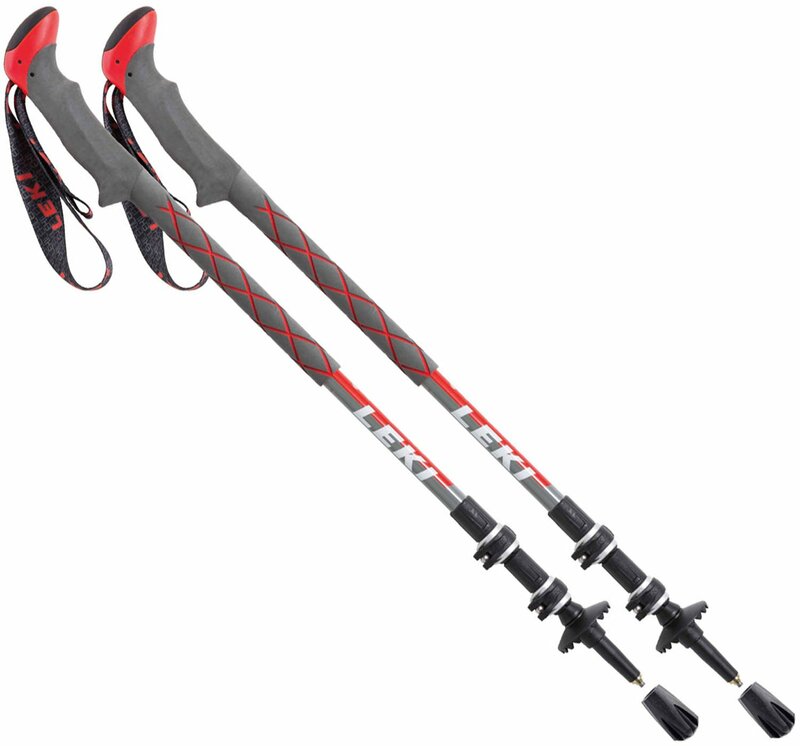 The Leki Thermolite Anti-Shock are 3-piece hiking poles and are extremely lightweight weighing only 242g. Made from aluminium they offer good durability making them ideal for those hikes on rough terrain. Featuring an extended grip ensures you don’t always have to adjust them when journeying downhill. The Dynamic Suspension System minimises impact forces on the joints and the speed lock clamping system offers quick and reliable adjustability, which is again ideal for rough terrain. 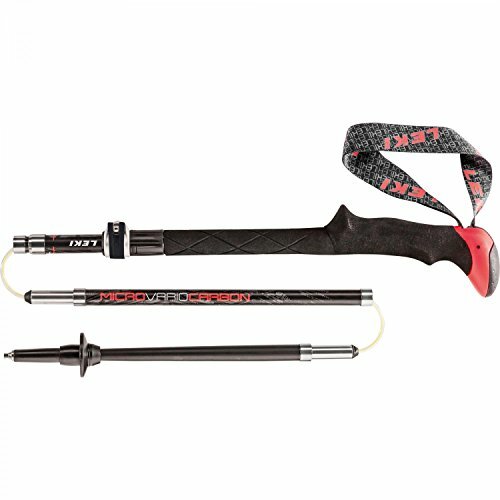 If you are looking for a lightweight and durable set of hiking poles that don’t cost an awful lot of money, then the Black Diamond Alpine FLZ hiking poles may be just what you have been looking for. These are the perfect all year round hiking poles packed full of the latest technology. The Slidelock adjustable feature makes them some of the most practical and easy-to-use trekking poles we have come across. Recent improvements mean they are now 30% stronger than previous models. The three-section foldable design ensures they are easily packable and fit into a backpack with no trouble at all. Durable, packable and highly versatile, the Alpine FLZ Poles come highly recommended and rank high in many hiking pole reviews. 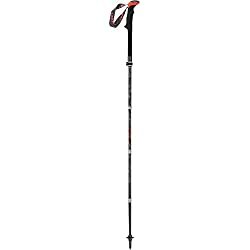 Made from 100% carbon the Leki Vario Walking Poles are the number one choice for many hikers throughout the world. Extremely lightweight and durable they are designed for those that like to stomp to the top of mountains with no messing about. Featuring a push-button release system for quick assembly and disassembly making the very practical. Surprisingly even though these are foldable hiking poles they still come with a very impressive 20cm adjustability. Featuring a triple anti-shock system they are suitable for all terrains. 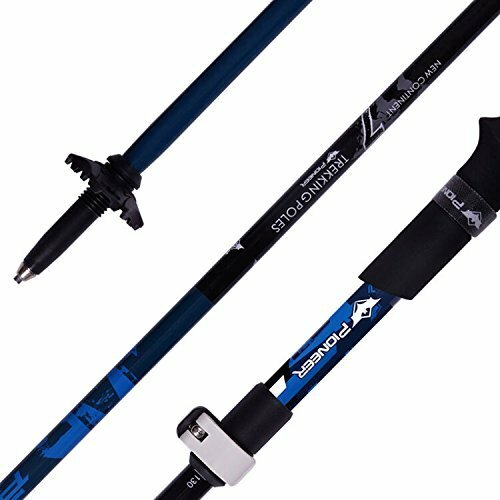 With a 140Kg holding force per pole these are some of the most durable carbon fibre hiking poles on the market. 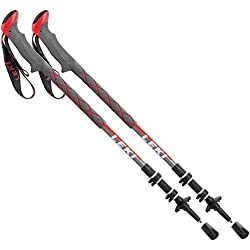 Without spending an absolute fortune these are some of the very best trekking poles around and are definitely worth taking a look at if you want high-quality at a reasonable price. Folding Poles : Lightweight with the smallest pack size. Ideal poles for climbing, trail running, small tours or to take along on the road. Aergon : Ultralight and edgeless Aergon Thermo Mid grip with grip expander for a comfortable fit. 100% Pure Carbon : Pure carbon for pure joy. Super light and stiff for optimal swing action. 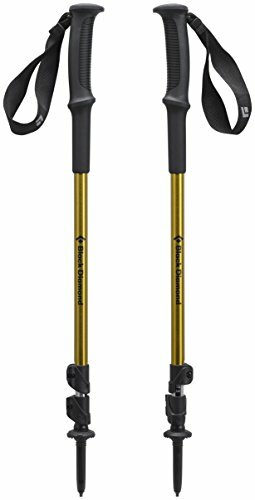 The Black Diamond Trail Sport 3 Trekking Poles come with excellent customer feedback from previous buyers, which is hardly surprising as they are reasonably priced and offer excellent quality. With many of the features of far more expensive poles checking these out could save you from paying over the odds on a different pair. They are a 3-section pole offering simplicity and practicality making them the ideal no fuss trekking poles. The dual flicklock adjustability provides fast and secure adjustability for when encountering variable terrains. 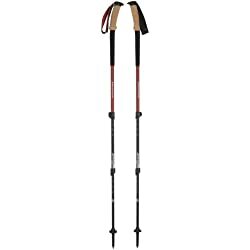 Weighing 320g and adjustable from 100cm to 140cm they are well within the range of what makes a good pair of hiking poles. 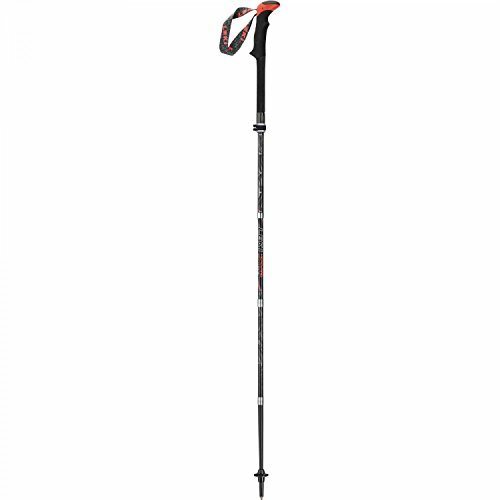 If the previous models featured in our reviews are not within your budget then you may be interested in the Lysport hiking poles. In terms of value for money you would struggle to find a pair of hiking poles that have as much to offer as these do. Made from carbon fibre and aviation aluminium with a tungsten tip they are extremely lightweight and very sturdy. Adjustable from 110cm to 125cm and when folded they are only 33cm long meaning they easily fit in even the smallest of backpacks. Suitable for all terrain and weather conditions they can be used all year round and all at a fraction of the cost of the other models in our reviews. 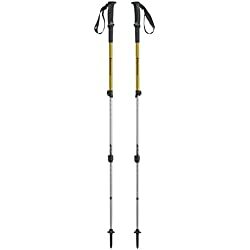 If you are looking for the best cheap hiking poles then look no further. [Ultralight Yet Super Strong] It’s made of extremely lightweight yet strong carbon fiber and aviation aluminum alloy with the tungsten tip which features the pole ultralight and extra sturdy. Carbon Fiber material has a strong shock absorption effect. [Adjustable] The pole are quickly adjusted from 45" to 51" using a speed lock. The external pull mouth is easy to lock. Greatly strengthen safety. Polyester fiber strap adjusts to fit desired tension, less hand fatigue, easy to hold. [Foldable & Compact] The unique folding design packs down to 13.4 inches in length, 8.4oz, easy to fit into a carry-on or small backpack. Assembly is simple and just takes a few seconds. 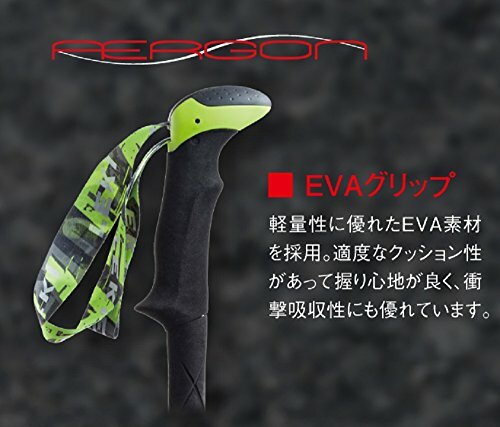 [Ergonomic & Secure] EVA foam offers you a maximum non-slip, comfortable and secure grip. Natural shock absorbing with removable durable rubber tip and mud basket , make it suitable for whatever terrains. [All Terrains, All Conditions] The pole can be used for whatever terrains and conditions, wear-resisting . Easily carry in a backpack when folded. Fit for trekking, adventure, hiking, backpacking, ultra trail, climbing and mountaineering. Hiking poles are an essential piece of equipment and a must buy for the serious hiker who cares about their safety. With the information packed in our buyers guide and reviews you should have no trouble finding the best hiking poles for both your needs and budget. If you can think of any information we have forgotten to include in our buyers guide or maybe a set of hiking poles that are worthy of a place in our review section then please leave us a message in the comments below.